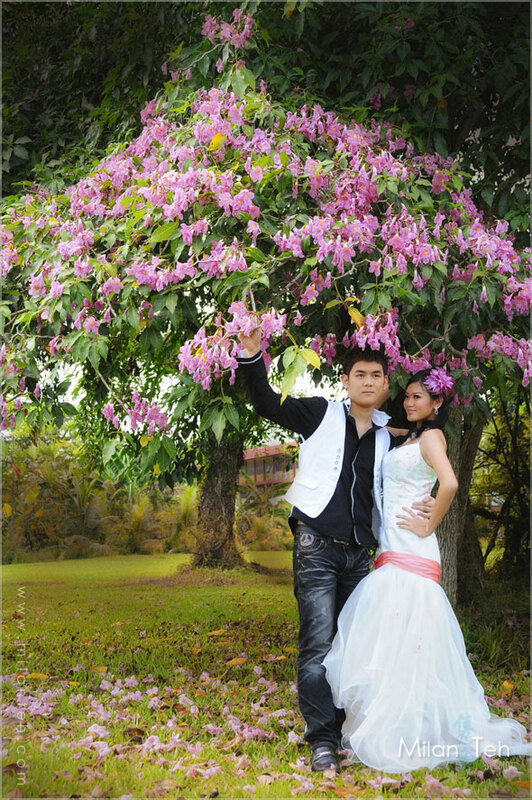 Love Diary, is a set of photos that depict your loving moments with your life-time companion. In other terms, it's actually a series of pre-wedding photos from Milan Teh Studio. We did get some inquiries regarding of Love Diary and very often, clients ask why we don't have any pre-wedding photos on our site? This post is to answer everyone of you. Here(www.milanteh.com), we will only feature photos that we shoot for clients of Milan Teh Studio. We don't have clients for Love Diary from January to March 2010 yet. You might then wonder, how about what I shot previously before 2010? I used to work with a bridal house in Penang. Starting from the position of assistant photographer, I was then appointed and given the camera to shoot there after one month of working. Throughout my service, I dealt with a lot of glamor shoots, family portraits, baby portraits, and last but not least, pre-wedding photographs. I left(on February 2010) because the working environment there is not what I adore and I would wanna try new things and develop my own way of getting things done. However, due to copyright agreements, I am not allowed to use any photos that I have shot for that bridal house. Wedding is one of the occasion that we spend a lot in our life time. I could understand some clients' concern since they don't have much sample to see from our website. Starting from today until June 2010, we are offering Love Diary-Beta. This is a special offering that lets you test run our pre-wedding photographs with the cost of one makeup & hairdo only, which is RM300.00 for couples who confirmed with us before 1st of July. We believe in getting paid for how much effort we put in every assignment. So for this price, you will get: 1) TWO(2) one hour pre-wedding shoot from me on TWO(2) different locations. 2) Bride's makeup & hairdo by Joan. Since January until now, because that Milan Teh Studio is very new to everyone, I've noticed that I kept telling people what do we offer and I could sense confusion among them because these information were included in different blog posts. Worry not, as I'm writing, I'm in the midst of creating a page that summarizes all our services, offerings and price. Therefore, you can easily understand what I was saying all these long. To be exact, it is the new "Services & Rates" button above. After being long winded previously, hope that all of you would enjoy the first set of pre-wedding photos I'm posting here, taken at Limbang, Sarawak.